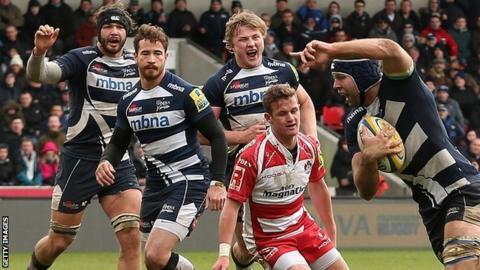 England's Danny Cipriani slotted five from five kicks and set up the clinching try for Josh Beaumont as Sale cruised to victory over Gloucester. Two penalties from James Hook kept the visitors in touch after a poor first half but Sharks led 10-6 courtesy of Johnny Leota's try and Cipriani's boot. Cipriani added two more penalties and his fine pass teed up Beaumont. And although Gloucester responded in the final 20 minutes, Sale defended with relative ease to secure the win. And an improved second half, in which they played the blustery conditions with far greater common sense, ensured they held on to win despite some late Gloucester pressure. Former England winger Mark Cueto has scored 116 tries in his 300 appearances for Sale Sharks. Cueto is the Premiership's all-time leading try scorer with 88. James Hook slotted an early long-range penalty for the visitors and they had a couple of half-chances to cross the home try line but neither side impressed in an uninspiring opening 40 minutes. However, Leota powered over from close range to put the Sharks ahead and Cipriani's careful kicking stretched that lead to a telling ten points at 16-6 soon after the restart. With Sale now making the most of their forward dominance, a rare moment of quality saw Cipriani's well-timed pass allow Beaumont to go over after Tom Arscott was stopped just short of the line. Cipriani once again converted and although Nathan Hines and Cipriani were both sin-binned late on, Gloucester, were unable to make their extra man count in the closing stages. The only late excitement came when bloodied former England wing Mark Cueto, who was making his 300th Sale appearance, left the field to a standing ovation with a couple of minutes to go. Sale director of rugby Steve Diamond: "The first goal is to qualify for the Champions Cup and we want to finish in sixth to do that. "We'll just try to win every game. If we do then we will finish in the top six, but I do think the top four is a bit away from us and we're probably just off that. "We've not got a squad that can compete with the top four, but at home we're a good side and it's difficult (to come here) as we've proven against Gloucester, Northampton and Saracens. "The run-in for us is good for the fact that we get a rest after every week and, with the ageing squad that we've got, it gives them time to recover." Gloucester director of rugby David Humphreys: "I was most disappointed with the performance. "Over the last few weeks we would say as a team and as a squad we've performed pretty well for most of the time. "We haven't always got the result we felt we deserved, but there have been certain parts of our game around the energy we bring to our defence and attack, the enthusiasm that has been there and you can never question the heart. "I don't think today was about questioning any of that - it's just that it wasn't there in the first half. Setting aside the result, we felt that was the most disappointing aspect after a very positive training week." Sale Sharks: Haley; Arscott, Leota, Tuitupou, Cueto; Cipriani, Cusiter; Harrison, Taylor, Cobilas, Ostrikov, Hines, Braid (capt), Seymour, Beaumont. Replacements: Neild, Lewis-Roberts, Parker, Mills, Lund, Cliff, Ford, Brady. Gloucester: Burns; Sharples, Macken, Twelvetrees (capt), May; Hook, Braley; Wood, Hibbard, Afoa, Stooke, Palmer, Savage, Kvesic, Kalamafoni. Replacements: Dawidiuk, Thomas, Puafisi, Galarza, Hudson, Robson, Meakes, Moriarty.